Please keep the orders coming; increase the variety! Not one but two Sleigh Beds were ordered this past year, both by the same customer. I’d been wanting to build one for 30 years. Kurt makes me work, drawing several possibilities before making a choice of designs, but the results made everyone happy! The two bedrooms required chests of drawers and nightstands as well. The designs were radically different, one an unusually high (a trundle bed fits beneath) contemporary sleigh bed: and the other a more traditional design though its matching bedroom suite is anything but traditional: The contemporary sleigh bed is cherry and maple, the more traditional sleigh bed and bedroom suite is constructed of butternut. Cherry and maple are quite hard woods and suitable for the boy’s bedroom and rugged treatment. Butternut is one of the softest “hardwoods” and was chosen, in this case, for its beautiful soft brown color. The rest of the butternut bedroom suite is pictured below and includes two 3-drawer night stand chests, a lingerie chest and a long low chest of drawers. These two Shaker Inspired Bowback Benches , made in the past 3 months, were slight variations on my standard Bowback Bench marketed in cherry with ash spindles and figured maple legs. 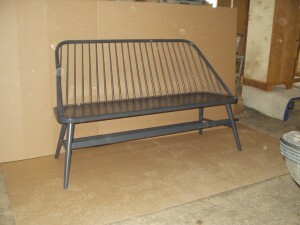 The first is a five foot bench painted dark grey (light black) for a customer in Colorado. The second is a 6 foot bench constructed of FSC Walnut and FSC Hickory for a customer in the Baltimore area. I make these contemporary Windsor Benches in various sizes; 4, 5, and 6 foot are the standard sizes, but I can and have made them in other sizes as well. My Bowback Bench design is a combination of all I learned working for Thos. Moser (1980-1986) and some Shaker influence as well. The FSC lumber came from Rex Lumber in South Windsor, CT. The work was completed in Windsor, VT. I recently completed a Custom Walnut Partners Desk project. Each side has three pencil drawers. The proportions are substantial, a good piece of furniture to jump under in case of an earthquake. Above you will see photos of a dyed FSC Walnut Desk ( in my “Pencil-Leg Style”) ordered to go in Leeds certified building. The dyed FSC Walnut Credenza/Computer Work Station pictured below was ordered later to compliment the desk. I will post photos (I hope) from the office later. The Writing Desk (Dims: 72″H x 36″D x 32″H) has two pencil drawers. The Credenza, pictured before its final finish rub-out and assembly, (Dims: 74″W x 22″D x 32″H) has four legal files as well as a pop-up power communication dock from Doug Mockett (http://www.mockett.com/technology-into-furniture-integration/power-communication-systems/aluminum/pcs50e.html).